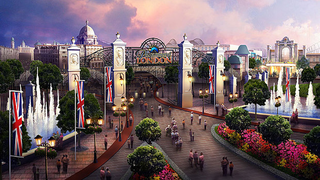 There's Going To Be A BBC-themed Theme Park In 2020. Wait, What? You read that headline right. The BBC have signed a deal that will see rides based on some of their biggest shows - including Sherlock, Top Gear and Doctor Who - appear in a huge new Paramount Theme Park opening in the UK in 6 years. The timey-wimiest place on Earth? Let's hope so. The deal between the BBC's commercial branch and London Resort Company Holdings would see the broadcaster have a chunk of the £2bn theme park set to be built in Kent - which would feature other Paramount properties like Star Trek and Transformers - given over to its most popular properties, including fandom favourites Doctor Who and Sherlock. The TARDIS and the Enterprise, in the same park! Obviously, it's a while off at the moment (Paramount are planning an Easter 2020 opening) but still, the idea of a BBC-land as part of this massive themepark, set to supposedly rival Disneyland, is equal parts awesome and batshit absurd. Personally, I'm hoping for a Sherlock ride that is basically you being pushed off the edge of a tall building while attached to a bungee rope. Queue up for The Reichenbach Fall!